Get ready: Your once-a-year chance to save on Target gift cards is happening this Sunday. Target gift card day on Sunday, when you can save 10% on Target store gift cards. You can buy up to $300. Online or in store. 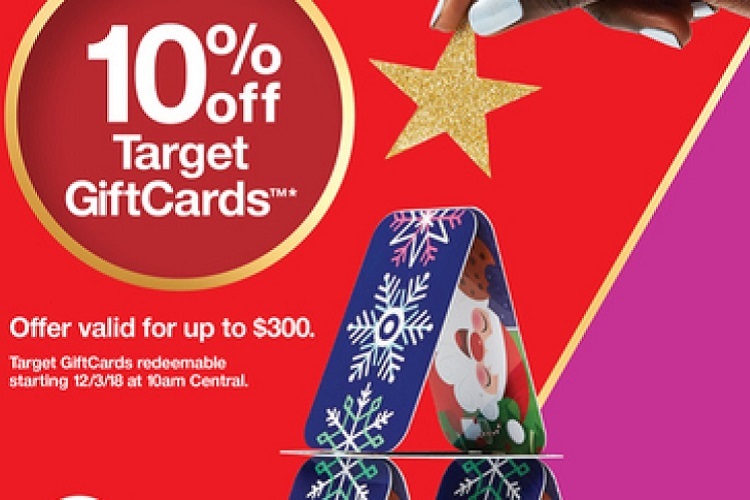 Target Corp. is planning a big push on its in-store gift cards, with this offer of 10 percent off the cards in a one-day sale this weekend. No discount code is required for customers to take advantage of the sale, which runs all day Sunday, Dec. 2. The offer is valid for up to $300 in Target gift-card purchases per household. The gift cards may be redeemed beginning Monday, Dec. 3 at 10 a.m. Central. The offer is part of Target’s “Weekend Deals” series, which was first introduced during the 2017 winter holiday season and offers discounts on a rotating series of categories. If you’re a Target shopper and love saving some cash during the holiday season then you’re going to want to make a Target run, or visit their website, on Sunday. Your gift card must be a minimum of $10 and can be purchased both in-store and on Target.com. According to Target’s website, the “offer does not include Target Visa Gift Cards, Target MasterCard Gift Cards, Target American Express Gift Cards and gift cards issued by other retailers such as dining, lifestyle and entertaining gift cards.” So if you want to buy a gift card for someone who loves Target as much as you do or just want a gift card for yourself then be sure to set a reminder for this weekend. According to a National Retail Federation survey, 56 percent of consumers are expected to buy gift cards. And if you’ve been thinking about giving gift cards to anyone for the holidays (or just want to save money on your own future Target purchases) this is the perfect sale to take advantage of. So if you want to buy a gift card for someone who loves Target as much as you do or just want a gift card for yourself then be sure to set a reminder for this weekend.